Occasionally I find cool bacon news/stuff and don't want to do a full review or article on it, so I've decided to do a weekly (?) roundup of the weird and/or wonderful things I find on these internets relating to bacon. 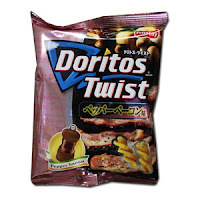 You can buy "Japanese Snack Treat" right here. Brandon Matzek at kitchenkonfidence.com will teach you to make this! 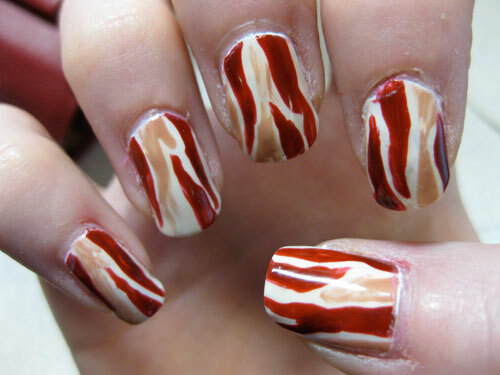 I saw this awesome photo of bacon nail polish and tracked it down to The Daily Nail. This was actually Day 28 in her 365 days of nail art project a few years back. So cool. I would totally lick them all day, though. Yes, they called them "mancakes". It's a Betty Crocker recipe! Getting a bit daring in your old age there, aren't you, Betty? The link takes you to the video - the recipe link is below that. 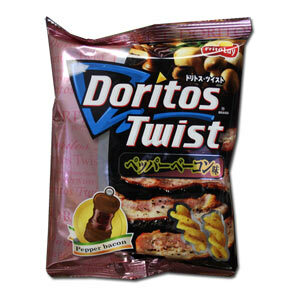 This is the most awesome thing ever. And Booturtle is the most awesome wife ever for making this for her husband! I think I have a girl crush on her... even if she IS a vegetarian.